A black-tailed rattlesnake done in pen & 2 colors of ink on calligraphy paper. This species is native to the southwest deserts of North America & has several color variations. 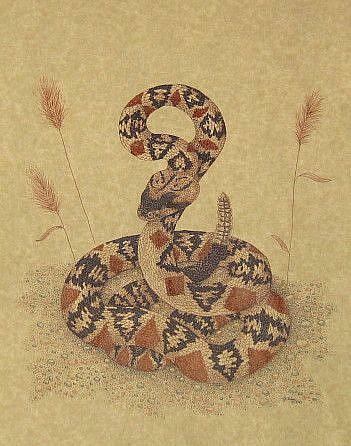 Each of the snake scales & pebbles were done individually, so it took a long time to finish this drawing. Was part of the 2010 Cold-Blooded Creations art show in Daytona Beach, Florida.